I’m a little neurotic when it comes to driving long distances. I worry. I worry about how good of a driver I am. I worry about other drivers and mistakes they might make. I worry about animals leaping from the ditches onto my car. I worry about my car and if it’ll break down or straight up explode as I’m charging down a crowded highway. I know it’s silly. Watching for animals is important, but a raccoon isn’t going to spring from nowhere, flailing its tiny claws, to latch onto my windshield. My engine won’t shatter into a giant fireball because I’m pushing 67 miles per hour. I’m generally a pretty cautious driver. But I worry. Sure, flipping your headlights to bright produces that cool Star Wars light speed effect, and you and your wife can pretend you’re Han Solo and Chewbacca. But for those of us hoping to avoid horrendous car crashes, it’s not so fun. I read once that we humans have a tendency to imagine the worst possible outcome to any situation, no matter how unlikely. It’s an intuitive mindset we evolved into, back when freezing to death and razortooth woolly mammoth attacks (or whatever) were a bit more commonplace than they are today. It kept us alive. But today, for most people, that line of thinking usually serves no purpose other than ramping up our anxiety and stress levels until we’re on the freeway to Grandma’s house, screaming at our kids for picking their noses. And in the wintertime? Forget about it. Wintertime driving on the highway is like a stress sandwich with a side of jitter chips. Maybe it’s snowing and visibility is horrible. Sure, flipping your headlights to bright produces that cool Star Wars light speed effect, and you and your wife can pretend you’re Han Solo and Chewbacca. But for those of us hoping to avoid horrendous car crashes, it’s not so fun. It’s worse than simply not being able to see the road. It’s not being able to see the road plus a cloud of moving points of light – a swarm of frozen moths sent from hell to distract you from, you know, staying alive. Oh, and what about “black ice?” Sure, Black Ice is a great name for an international jewel thief, but if I’m driving to the Twin Cities for the weekend, I don’t want to hear the phrase. 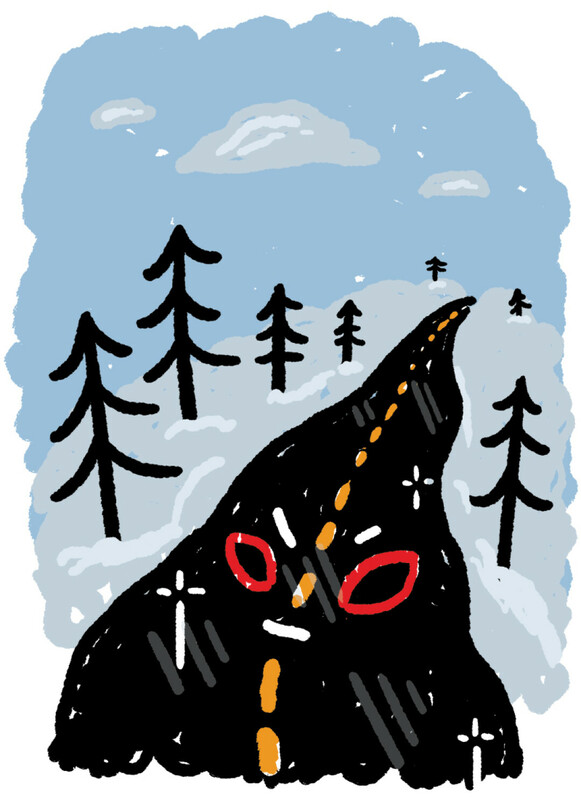 Our parents built up black ice into this wintertime boogeyman, an urban legend designed to scare young drivers into following traffic laws. Use your blinker to change lanes or Black Ice is gonna getchya! Except it’s a real thing. The legends are true. Black ice forms when freezing rain falls, when ice forms on a layer of water. The resulting clear ice exposes the dark, damp road beneath giving it a black sheen. It’s hard to tell if the road is slick and dangerous or simply wet. And for me, the worst part is not knowing. Is it safe to drive the speed limit? Or will any speeds over 25mph result in a sickening spin? And “glare ice?” As far as I can tell it’s just shiny ice with a neat name. A neat name that should strike fear into your heart because glare ice is slippery and it’s coming for you and your family. And what if your windshield wipers ice up because they’re crappy and you’re too lazy to replace them? Once they take on ice, they stop clearing the window of moisture. In fact, the ice rubbing back and forth across the glass just freezes the water into a patch of more ice. So instead of a clear view of the highway, you’ve got a jumbled kaleidoscope of taillights and turn signals. What else can you do? You must do that thing where you reach out your window and grab the wiper as it swoops by so you can slap it onto the glass and dislodge the icy chunks from your crappy blades. While watching the road through the one little spot that’s clear. On slippery asphalt. As a giant semi truck roars up in the passing lane. And a badger launches itself from a nearby pine tree, crashing into your windshield, clamping onto your hand with its vile little teeth. And your engine explodes. At the very last moment, you glance into your rearview mirror for a final look at your children. There they are. Picking their noses. Again, I’m a little neurotic when it comes to driving long distances. I’m working on calming my nerves. Until I can do that, I’m just going to drive really slow. Pass with caution.